Dr. James Vogel meets with his out-of-town patients by utilizing technologies such as Skype™ and FaceTime. Baltimore, MD — Patient consultations are extremely important, according to Baltimore plastic surgeon Dr. James Vogel. He says when his patients are traveling from out-of-town, though, it can become difficult to coordinate a way to meet. As a way to improve communication with these patients, Dr. Vogel has implemented virtual consultations at his practice. 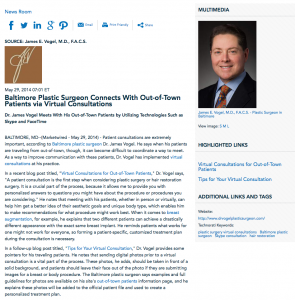 In a recent blog post titled, “Virtual Consultations for Out-of-Town Patients,” Dr. Vogel says, “A patient consultation is the first step when considering plastic surgery or hair restoration surgery. It is a crucial part of the process, because it allows me to provide you with personalized answers to questions you might have about the procedure or procedures you are considering.” He notes that meeting with his patients, whether in person or virtually, can help him get a better idea of their aesthetic goals and unique body type, which enables him to make recommendations for what procedure might work best. When it comes to breast augmentation, for example, he explains that two different patients can achieve a drastically different appearance with the exact same breast implant. He reminds patients what works for one might not work for everyone, so forming a patient-specific, customized treatment plan during the consultation is necessary. In a follow-up blog post titled, “Tips for Your Virtual Consultation,” Dr. Vogel provides some pointers for his traveling patients. He notes that sending digital photos prior to a virtual consultation is a vital part of the process. These photos, he adds, should be taken in front of a solid background, and patients should leave their face out of the photo if they are submitting images for a breast or body procedure. The Baltimore plastic surgeon says examples and full guidelines for photos are available on his site’s out-of-town patients information page, and he explains these photos will be added to the official patient file and used to create a personalized treatment plan. Ultimately, Dr. Vogel says by embracing programs such as Skype™ and FaceTime for virtual consultations, he is better able to serve his patients, no matter where they live. Dr. Vogel has been voted a “Top Doc” by Baltimore Magazine for three consecutive years. After earning his medical degree from Mount Sinai School of Medicine, he went on to complete a plastic surgery residency at the Johns Hopkins Hospital. Dr. Vogel also serves as an Associate Professor in the Division of Plastic Surgery at the Johns Hopkins School of Medicine. He is available for interview upon request.